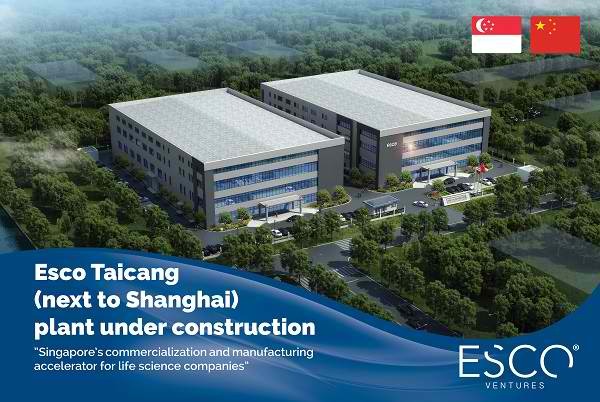 Esco Group breaks ground on its Jiangsu Innovation Center, a new 20,000m2 manufacturing and innovation complex located in Taicang, Suzhou, Jiangsu, just 50km from central Shanghai. Scheduled to be completed by end 2019, the Esco Jiangsu Innovation Center will be a platform for acceleration and commercialization of life sciences, medical devices, reproductive medicine and precision medicine technologies to serve the rapidly growing Chinese market and to address unmet needs for Chinese patients. It will serve as a focal node in Esco Group’s global network of manufacturing plants and innovation centers, collaborating closely with the Esco Group mother plant in Bintan, sister plants in US/Europe, and also with the Esco Ventures X incubators in Singapore and Beijing. “As one of the twin pillars of the world economy, China is a strategic market for Esco Group, with our business growing 40% per annum currently. With many unmet medical needs, a large and aging population, the China healthcare and life sciences market is one of our core focus growth areas.” remarked XQ Lin, Esco Group President & CEO. With the completion of this facility, Esco Group will further invest into local R&D as well as collaborate with academic institutions such as the Henan Province People’s Hospital. Furthermore, the Group will also pursue collaborations with startups such as AT Medical UAB and Carmentix Pte Ltd in order to more rapidly commercialise innovative technologies to address unmet needs.